Alan Gribben, Auburn University Montgomery professor and noted Mark Twain scholar, spoke Saturday at the inaugural “History at High Noon” lecture series at Old Alabama Town. Dr. Gribben’s lecture, “The World According to Mark Twain,” taught listeners about Mark Twain’s life and the full range of his writings. Gribben explained that even though Twain’s reputation has in recent years rested on The Adventures of Tom Sawyer and Huckleberry Finn, he was better known in his lifetime for his travel writing. “People during that time did not think of him as a fiction writer,” Gribben noted, as reported by Alvin Benn of The Montgomery Advertiser. “Twain had difficulty at times developing plot lines for his novels and much preferred his travel books,” mainly because a trip had already formed the structure of those works. Dr. Gribben wrote the introduction to NewSouth’s Alabama Big Read edition of The Adventures of Tom Sawyer, published last year. Currently, he is working with NewSouth on a combined edition of The Adventures of Tom Sawyer and Huckleberry Finn that replaces the books’ racial epithets-which Twain used to reflect the societal standards of the nineteenth century-to enlarge the potential audience of students and teachers. Gribben explains that Mark Twain’s novels “can be enjoyed deeply and authentically without those continual encounters with hundreds of now-indefensible racial slurs.” Numerous editions use the derogative words, and Gribben believes that their presence has gradually diminished the readership of Twain’s two masterpieces. This new edition will be the first of its kind to make this substantive change. The Alabama Big Read Edition of The Adventures of Tom Sawyer is available from NewSouth Books, Amazon.com, or your favorite retail or online bookseller. Alan Gribben’s new volume, Mark Twain’s Adventures of Tom Sawyer and Huckleberry Finn: The NewSouth Edition, will be available in February 2011. Participants in the Big Read at Thomasville Library celebrated with an old-fashioned party featuring games, a visit with “Tom” and topped off with a cake reproducing the cover designed for the special Alabama edition of The Adventures of Tom Sawyer published by NewSouth Books. The Adventures of Tom Sawyer is available from NewSouth Books, Amazon.com, or your favorite retail or online bookseller. On Your Mark, Get Set, Alabama Big Read! Alabama readers will dive into The Adventures of Tom Sawyer after the kickoff of the Big Read program held yesterday, February 2, on the steps of the State House in Montgomery, Alabama. Lt. Governor Jim Folsom began the initiative by reading the first page of Mark Twain’s classic novel, surrounded by legislative representatives and librarians. Sponsored by the state libraries of Alabama, the event inaugurated Alabama’s first ever Big Read program, highlighted by the publication of a special edition of Tom Sawyer produced by NewSouth Books. 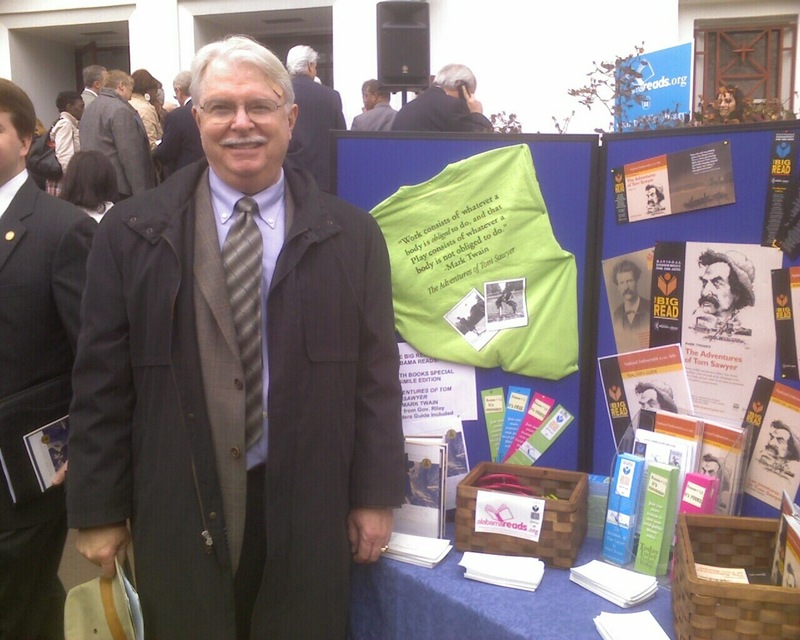 Dr. Alan Gribben with the Tom Sawyer display at the Alabama Big Read kickoff. Kickoff participants included Rebecca Mitchell, State Librarian; Mark Dixon, Deputy Policy Director; Rep. Greg Canfield; Dr. Alan Gribben, Twain scholar and author of the foreword to the special Alabama Big Read edition of Tom Sawyer, Randall Williams, NewSouth Books co-founder and editor-in-chief, and Brian Seidman, NewSouth Books managing editor. In a bit of serendipity, a group of Scouts was visiting the State Capitol at the time of the kickoff, and several asked Dr. Gribben to sign copies of his introduction to Tom Sawyer. The Adventures of Tom Sawyer is Mark Twain’s enduring paean to the joys of childhood in a small town prior to the Civil War. In this novel Twain discovered the literary potential of his early days in Hannibal and created a pair of young characters, Tom Sawyer and Huck Finn, who would earn him lasting fame. NewSouth Books is especially pleased to have been selected to produce the unique Alabama edition. Alabama’s first-ever statewide Big Read project moves into high gear next week as Big Read regional coordinators and NewSouth Books arrange for delivery of close to 12,000 copies of The Adventures of Tom Sawyer to librarians across the state. Move over FedEx! In keeping with the Alabama theme, the Alabama Big Read Bus has been named the delivery vehicle of choice. The Big Read Bus will travel the state on September 10 and 11 distributing copies of a unique edition of the Mark Twain classic created especially for Alabama readers by NewSouth Books. On its two-day mission, the bus will stop at the main branches of library systems in 14 cities; local librarians will then send copies to area branches. A big banner announces the vehicle’s purpose, and plans are being made from library to library to celebrate its arrival. 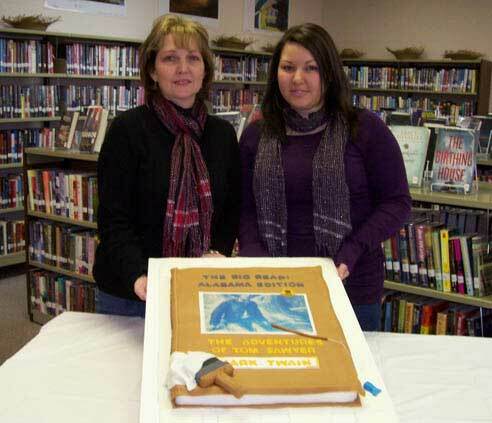 Libraries scheduled to receive a visit by the Big Read Bus include: Marion-Perry County Library, Marion, AL; Anniston-Calhoun Library, Anniston, AL; Ashland City Public Library, Ashland, AL; B. B. Comer Memorial Library, Sylacauga, AL; Birmingham Public Library, Birmingham, AL; Columbiana Public Library, Columbia, AL; Harrison Regional Library, Columbiana, AL; Chambers County Library, Valley, AL; Autauga Prattville Public Library, Prattville, AL; Horseshoe Bend Regional Library, Dadeville, AL; Gulf Shores Public Library, Gulf Shores, AL; Choctaw County Public Library, Butler, AL; Washington County Public Library, Chatom, AL; Juliette Hampton Morgan Library, Montgomery, AL; and Daleville Public Library, Daleville, AL. NewSouth’s edition of The Adventures of Tom Sawyer is unabridged and annotated, carries a foreword by local Twain scholar Alan Gribben, and includes the NEA Reader’s Guide. The book is available for purchase in trade cloth and paperback. For more information about the Alabama Big Read Bus and its delivery schedule, please contact Lisa Harrison at NewSouth Books at 334-834-3556 or via email at info @ newsouthbooks.com. “I wanted to be just like Tom Sawyer as kid, but years later I realized it was Mr. Twain whom I truly wished to emulate.” So says award-winning author Ted Dunagan, whose debut novel A Yellow Watermelon, NewSouth Books published last year. Not surprisingly, Dunagan’s lyrical, semi-autobiographical account of the friendship between a young white and a young black boy amid the racial segregation of the 1940s has been favorably compared to the works of Twain by librarians and educators alike. Mr. Dunagan is one of two speakers NewSouth Books, publisher of the Alabama Big Read edition of The Adventures of Tom Sawyer, will be sending to talk to Big Read program participants about Twain and his literary legacy and influence. For programs aimed at young adults, Mr. Dunagan is an especially appropriate presenter. Respected Twain scholar Dr. Alan Gribben, chair of the English department at Auburn University Montgomery, will also available to present to Big Read audiences. Dr. Gribben is the author of several books on the subject of America’s beloved Mark Twain, including Mark Twain on the Move: A Travel Reader, and contributed the foreword to NewSouth’s edition. Given Dr. Gribben’s years of experience as a college-level professor and an ever lively enthusiasm for the inimitable Mark Twain, those with Big Read programs across the South could do no better than to recruit Dr. Gribben to participate. The Adventures of Tom Sawyer is available from NewSouth Books. For more information about presentations by Ted Dunagan and Dr. Alan Gribben, call NewSouth Books at 334-834-3556 or email Lisa Harrison at info @ newsouthbooks.com. It doesn’t happen often, according to Molly Thomas-Hicks at the National Endowment for the Arts (NEA), that a regionally based publishing house is selected to publish a work for its Big Read program. So NewSouth Books was especially honored to learn that it had been named to publish The Adventures of Tom Sawyer for the 2010 Alabama Big Read. Sincere thanks go to the NEA and to many folks in Alabama for identifying NewSouth as the publisher of choice, including Patty A. Pilkerton at UAB’s Mervyn H. Sterne Library, Jay Lamar, director of the Caroline Marshall Draughon Center for the Arts and Humanities at Pebble Hill, and to all nine Alabama Big Read regional coordinators. NewSouth’s edition of The Adventures of Tom Sawyer is unabridged and annotated, carries a foreword by local Twain scholar Alan Gribben, and includes the NEA Reader’s Guide. The book will be available for purchase in trade cloth and paperback in August 2009. You are currently browsing the archives for the Tom Sawyer category.